My name is Aleksandra, and I'm an American. I was born and raised in America and live in the United States. I am of Serbian descent, the daughter of parents who came to this country after World War Two and made America their permanent home. I wish I could have attended the reception given in your honor in Cleveland, Ohio on September 20th, 2009. Several friends did attend, and everyone was so pleased to have had the opportunity to spend time with you. 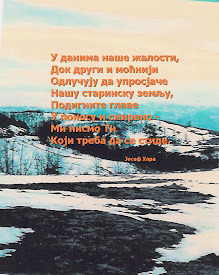 I'm writing this note to you, President Tadic, because I feel that two things deserve special recognition and attention and shouldn't be taken for granted either by Serbs in the homeland or us here in America. 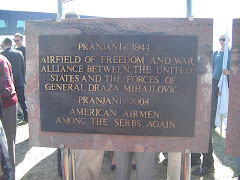 These two things relate to relations between the United States and Serbia under your administration and the progress that has been made in giving General Draza Mihailovich his due credit for all that he did for his beloved homeland as a true Serbian patriot during WWII and what he unselfishly and honorably did for the Allies in 1944. 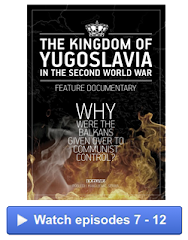 Simply put, relations between the United States and Serbia, especially as time goes by, have continued to improve after a very difficult period of time during which relations between the two countries, who first became Allies over a century ago, were severely strained. I'm very heartened by your unceasing efforts to reestablish goodwill between Serbia and America and I wish you genuine success in your quest to foster that goodwill. Thank you for your efforts, President Tadic, and for your optimistic and positive attitude. It is refreshing. receptive to recognizing his essential role in WWII. 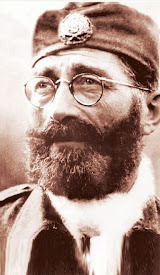 The progress that has been made in Serbia to finally bring to public light all that General Mihailovich contributed to his Serbian homeland and to give him the credit that has been long overdue is absolutely amazing. I know all too well the extent to which he has deliberately, for far too long, been kept a persona non grata in his own homeland for which he sacrificed everything, including his life. 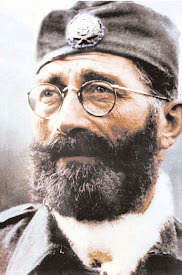 Now in Serbia, slowly but surely, especially in the last couple of years, his status as a true Serbian hero is being resurrected. The fact that this has happened in Serbia during the course of your administration, President Tadic, also reflects positive progress being made for which you deserve a heartfelt 'Thank you'. Much still needs to be done. 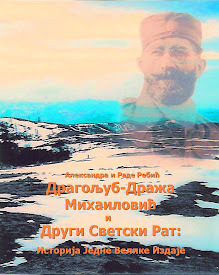 My hope is that the culmination of all this continuing progress will be a renewed Allied bond between America and Serbia and a gravesite for General Mihailovich where people from all over the world can come pay their respects in the manner that he deserves. I wish you Godspeed, President Tadic, and look forward to visiting Serbia once again in the coming years. 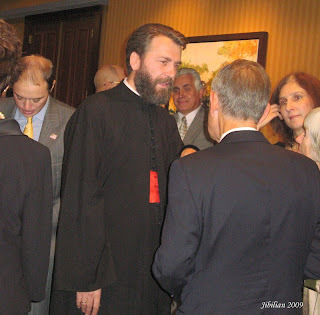 On Sunday, September 20, President Boris Tadic of the Republic of Serbia received a rousing welcome from Diaspora Serbs at an invitation-only reception of approximately 300 people at the Marriot Cleveland Downtown at Key Center in Ohio's largest city. 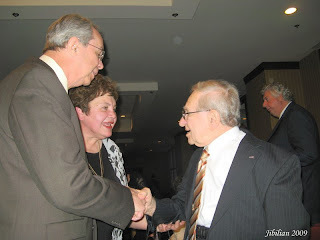 The visit was at the invitation of Serb National Federation [SNF] member Alex Machaskee, retired president and publisher of The Plain Dealer and current Honorary Consul of Serbia to the State of Ohio. "I am personally very pleased that President Tadic accepted my suggestion to visit Cleveland when I met with him in Belgrade early last May," said Machaskee. Dignitaries in the President's delegation included Vladimir Petrovic, Ambassador of the Republic of Serbia to the United States of America; Desko Nikitovic, Consul General and Nebojsa Acimovic, Consul, of the Consulate General in Chicago; Capt. 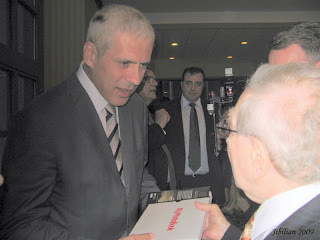 Ljubomir Nikolic, Defense, Military, Naval and Air Attache of the Serbian Embassy in Washington, D.C.; Serbian Foreign Minister Vuk Jeremic; and Vukman Krivokuca, Assistant Minister of the Diaspora. At the reception in his honor, Tadic met U.S. 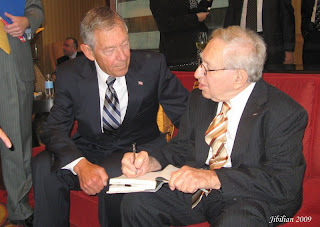 Senator George Voinovich and U.S. Congressman Dennis Kucinich, both of Ohio, and other officials and business leaders. 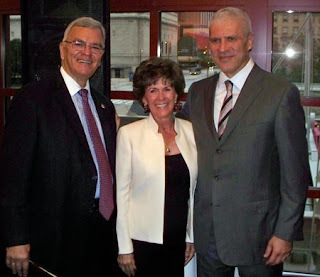 Representing the Serb National Federation were President Peter Borkovich and American Srbobran editor Sandi Radoja. In addressing the crowd, Tadic said he hoped to strengthen the ties between Serbia and Ohio. "Because of the large Serbian Diaspora in Ohio, the bond between our two governments spans the diplomatic spectrum including economic, governmental and military ties." Officials of the Ohio National Guard were also on hand. 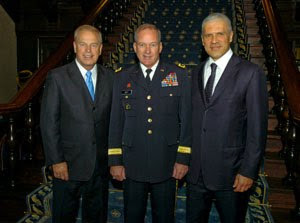 Under Tadic's leadership, Serbia has enjoyed a National Guard State Partnership program for training with the Ohio National Guard for the past three years, according to Major General Gregory Wayt, Adjutant General. 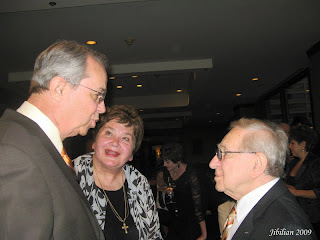 Following the general reception, several guests were invited to a private dinner where Senator George Voinovich also addressed guests. Tadic again spoke about business opportunity in Serbia and what the cooperative agreement with the Ohio National Guard has meant at home. During both the reception and dinner on Sunday, Tadic talked about the integration of Serbia into the European Union. He said it was important, in meetings with U.S. Vice President Joseph Biden earlier this year, that Biden offered open support of Serbia's EU integration on behalf of the Washington administration - and that support is not conditioned on Serbian recognition of Kosovo independence or on NATO membership. "Relations between Serbia and Washington will play a big role in our further European path," Tadic said. He also noted that the European Commission approved $100 million in aid for Serbia, to help the country achieve priority needs necessary for EU integration. 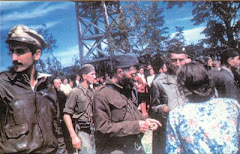 The extraordinary support was granted to eliminate the consequences of the economic and social crisis in Serbia. In an equally serious but exceptionally warm manner, Tadic spoke of the importance of Diaspora Serbs to "come home. 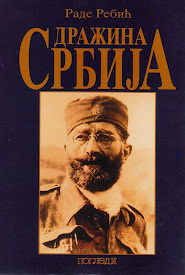 It is your Serbia, too, not just our Serbia. It is your country. Come and spend time there." On Monday [Sept. 21], Tadic addressed business leaders at a luncheon at the fashionable Union Club. Later, he toured the Serbian Cultural Garden in Rockefeller Park where he saw busts of Nikola Tesla, King Peter I, Petar Petrovic Njegos and Mihailo Pupin. During the visit, a ceremony took place to unveil that garden's newest addition, a bronze and granite iconic relief of St. Sava. Cleveland's Mayor Frank Jackson joined Tadic on the walk through the garden. The Plain Dealer reported that Jackson has visited several foreign countries in an "attempt to spur growth." Also on Monday, Tadic met with Ohio's Governor Ted Strickland to discuss economic cooperation. "Ohio plans on investing in alternative sources of energy in Serbia. From my point of view, this is very important for Serbia, which is a pillar for the energy sector in Southeast Europe, and that cooperation and investment could be very significant for Ohio too," Tadic said. He extended an invitation to Governor Strickland to come to Serbia and suggested he encourage businesses to invest there. "Many Serbs live in Ohio and that should be a bridge for cooperation between Serbia and the U.S."
Alex Machaskee & Associates, LLC. Photo courtesy of A. Machaskee. and accepts a special personal gift from the Jibilian family. Photo courtesy of Debi Jibilian. and given only a couple of months to live. 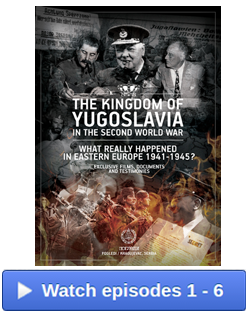 Nazi occupied territory in WWII Yugoslavia. 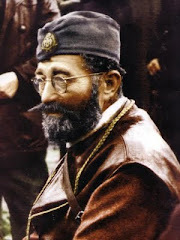 General Draza Mihailovich of Serbia. 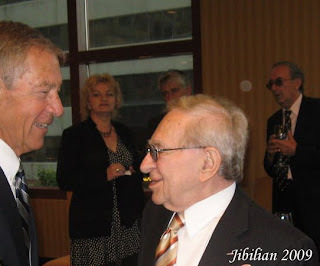 This was Jibilian's first time meeting the President of Serbia. one of the dignitaries present at the festivities. their rightful place in history. role. Photo courtesy of Debi Jibilian. 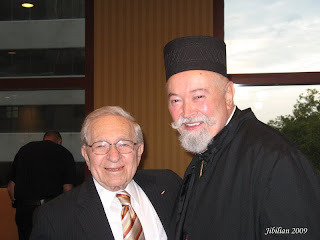 Arthur Jibilian and V. Rev. Fr. 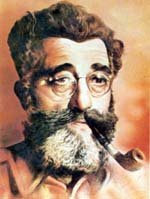 Vasilije Sokolovich. 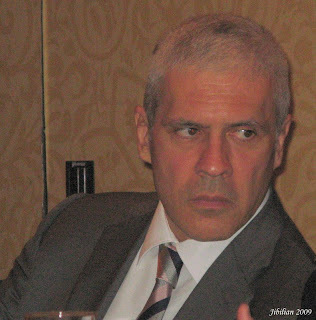 Photos courtesy of Debi Jibilian. 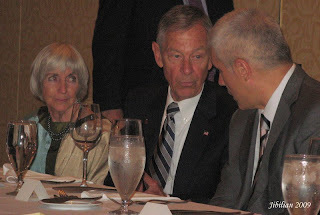 Senator and Mrs. George Voinovich of Ohio with Serbian President Boris Tadic, far right. 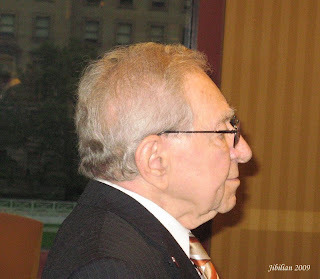 Aleksandra's Note: Mr. Alex Machaskee deserves special thanks for making the events of September 20-21, 2009 in Ohio happen. It is heartening to see such goodwill being fostered between the leadership of Serbia and various American political, military and economic leaders. I hope that such events will continue into the future as Serbia and the U.S. work together as the Allies they should always be. with the State Partnership Program. 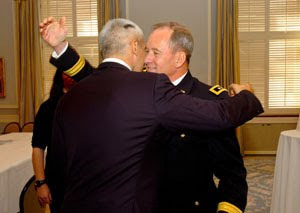 Serbian President Boris Tadic (left) embraces Maj. Gen.
following a Sept. 21 meeting at the Union Club in Cleveland. Marriot Hotel in downtown Cleveland. CLEVELAND, Ohio—The president of the Republic of Serbia arrived in downtown Cleveland Sept. 20 to further develop the nation’s ongoing relationship with Ohio that began in 2006 with the National Guard Bureau State Partnership Program. 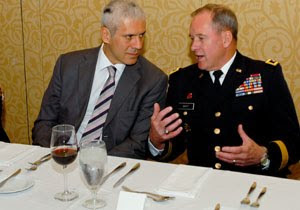 “The partnership with the Ohio National Guard is an important part of our partnership with the United States,” President Boris Tadic said. Tadic and Serbian Foreign Minister Vuk Jeremic are heading the Serbian delegation at the 64th session of the U.N. General Assembly in New York this week, but also scheduled this stop in Ohio to meet with Ohio Gov. Ted Strickland, leaders from Ohio’s business community and the National Guard. 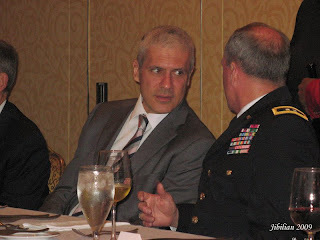 In three years of partnership there have been more than 80 exchanges between Serbia and Ohio and Maj. Gen. Gregory L. Wayt, Ohio adjutant general, said he had no plans of slowing down. Ohio National Guard Soldiers and Airmen enjoy interacting with not only Serbian Soldiers, but also Serbian citizens, and welcome more opportunities to conduct training missions together said Maj. Gen. Matthew L. Kambic, assistant adjutant general for Army. THANKS TO ALL WHO MADE PRESIDENT TADIC'S VISIT TO OHIO A SUCCESSFUL ONE.